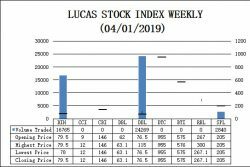 The Lucas Stock Index (LSI) rose 0.48 percent during the third period of trading in October 2018. 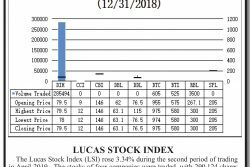 The stocks of five companies were traded with 127,522 shares changing hands. There were two Climbers and two Tumblers. The stocks of Republic Bank Limited (RBL) rose 4.33 percent on the sale of 86,908 shares. The stocks of the Guyana Bank for Trade & Industry (BTI) also rose 0.35 percent on the sale of 1,000 shares. On the other hand, the stocks of the Demerara Tobacco Company (DTC) declined 2.50 percent on the sale of 613 shares. 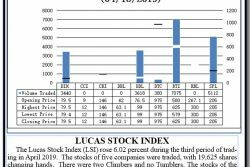 The stocks of the Demerara Distillers Limited (DDL) also declined 1.41 percent on the sale of 1,574 shares. 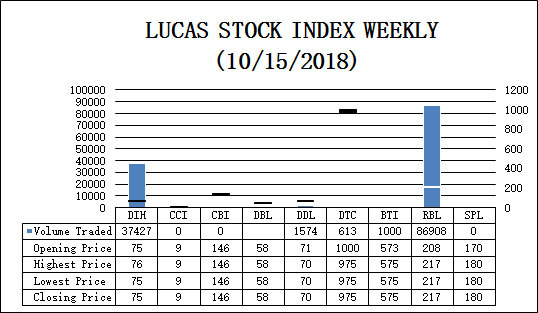 In the meanwhile, the stocks of Banks DIH (DIH) remained unchanged on the sale of 37,427 shares. The LSI closed at 483.51.